shauna Barber, who won the pageant Sunday night, when it aired on Fox. Barber, 26, works for the Department of Commerce and is a Captain in the Army and commander of the 988th Quartermaster Detachment at Fort Meade in Maryland. She’s from the DC area. “As a woman in the United States Army, I think it was an amazing job by our government to allow women to integrate into every branch of the military,” she said, to huge applause. I think I just shed a tear for #DistrictofColumbia‘s answer. How do you follow that?! ??????? ?#MissUSA ???????? 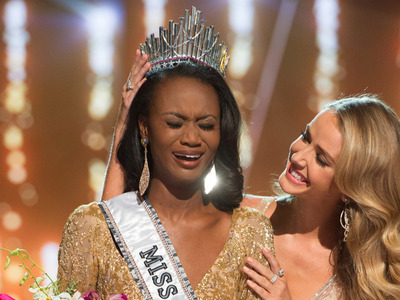 #MissUSA District of Columbia just won with that answer.